I will start by saying that I’ve never read any of Rowell’s other works, but after reading this one, I really want to. I got Advance reader Copy of it at Bookcon: it won’t be out until July. 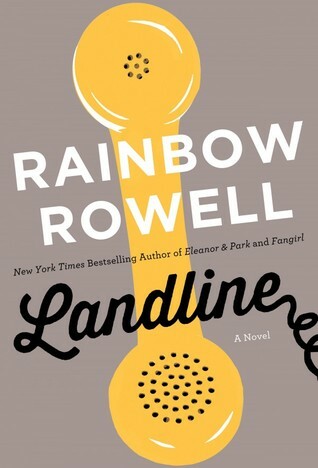 Landline was a fun read, and the realistic portrayal of her characters made it even more enjoyable. The plot focuses on the life of Georgie, a TV comedy writer, who struggles to balance her work and her family. It’s Christmas, and she as to cancel her vacation plans so as to finish the work on scripts for her dream show, which has a change to get produced. It’s her one shot, her big break – she sees no other option than to stay home. What she didn’t predict was that her husband, Neal, would take the kids and go on vacation without her. A familiar plot, it seems; although you’d probably see it with the working dad and stay at home mom, not the other way around. (thanks for equal representation, Rowell! I like you already!) However, this plot is not romanticized or made to be magical, like you see in so many novels. This is not the story of a romance – it is the story of a relationship. When Georgie finds a connection to her past, a phone that can reach Neal in the past, before they were married, she starts to question her present. Is this what she really wants? Is Neal actually happy? Did they make the right decisions? Can she – should she – change the past? Time plays an important role in the book, both in the plot and in the narration. The story jumps from one point in the relationship to the next, alternating past and present, showcasing side by side the beginning of the relationship, and the current status of it – possibly the end. While our present lies with a Georgie a few years into married life, in her past, she was once just falling for Neal. As the plot progresses, we learn both how Georgie and Neal fell in love, while Georgie deals with the challenge of saving that love. This mirrors the plot, with Georgie finding the link to her past, the yellow landline that reaches past Neal. Just as the narration melds past and present, Georgie speaks to Neal from the past, compressing the flow of time. As a reader, we get a full view of their lives together; first meeting, dating, marriage, children, and now, the fading out. She has a rare chance to affect the past – what kind of choices will she make? Will she fix her relationship, or end it? Is any of it even real? There are so many different kinds of love in the pages of this book. You’ve got platonic love between Georgie and her writing partner, Seth, her other half in comedy. Just like her relationship with Neal, the reader gets a full view from the its beginning to its current state: it is a colorful relationship, a perfect friendship, where they are closer to being siblings, their minds exactly on the same wavelength, in strict contrast with her relationship with Neal, which isn’t as effortless. We also have a familial love: Georgie’s family dynamic is fantastic. Her sister, her step dad, and her mom all offer her different relationship advice, while they don’t exactly have the most common love lives. I won’t say much more because of the spoilers, but even the pugs have their own uncommon love affair. I think what really resonated with me in this book, and what I really related with, but how human the characters are. They are people with depth and dimension, with lives, with loves; they are not romanticized stereotypes. Georgie has a human problem, human struggles. The narration just makes it feel like you're in her head, or that Georgie is talking with you, and every once and a while going "wait, to get this, you need to hear about what happened back then..."
She’s a normal person, to whom a strange opportunity arises. That’s the kind of person I like reading about. And the way she deals with her problem is also human. It’s not over the top, insane, unlikely, magical, over-romanticized. She does what any person in her situation would do, if they had guts. Don’t let me spoil the ending for you, but I was pretty happy with the resolution. A good marriage takes hard work, and I think there’s hope for Georgie and Neal. All in all, I want to give this book 4.5/5. It was and good read, and definitely enjoyable. I would recommend to anyone who enjoys a good love story, rather than a romance. It is a heartfelt, human story, and one I’m really glad I read it. Check out Landline's website for more. The sister, the pizzagirl, and pug puppies – this scene will make history. This book is adult fiction, rather than YA (which I am told is the genre of Rowell’s other books). I’d really like to read her other stuff after reading this one. She can’t reach current Neal – just like she couldn’t, fifteen years ago. What if another Georgie from even further in the future was talking with current Neal? Just a thought. I really wonder how Neal feels about all this. How much does he know? If he did, how would that change the ending?